ModelSpace » Motor Modeller » Senna McLaren MP4/4 » McLaren MP4/4 & Senna Discussion Forum » Which alternative carbon decals can be used? And I wondered if there are alternatives that can be used? Like how about the Tamiya carbon decals? When the monocoque is finished in yellow/gold, and then a carbon decal is put over it, would you still see the color finish? But will the Tamiya decals cover the paintwork completely? that I do not know. Anyone have a clue on this subject? Because I see many use the intended decals from Museum Collection or use nothing at all. The Autograph aftermarket decals were the ones to go for but there getting a rare thing to see on sale lately. Not sure I have seen others for sale for this kit. You could try just buying the decal sheets of carbon fibre and cutting out your own from them. 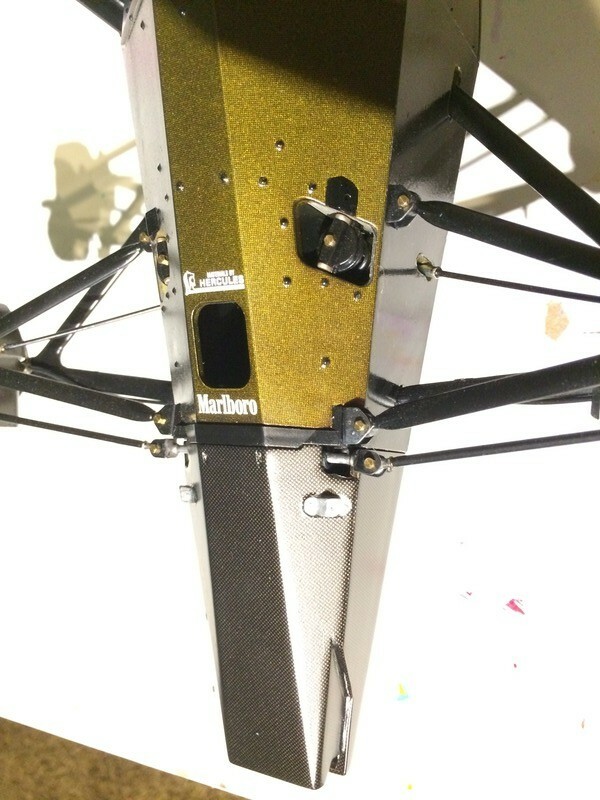 By the way the gold colour showing through the carbon is actually yellow kevlar which was used in the construction of the pod. like I said, I could find the Marlboro decals, they were from Autograph. I was informing about the Carbon decals from "Museum Collection"
So yeah, I could do all the cutting out myself from any other sheet of carbon, but if I dont see the gold through it, I might as well not color the monocoque. So that was my question. Ow well, it seems nobody has done it and I migth as well wait till the carbon pieces from "Museum Collection" come back in stock. The show where I found the Autograph Marlboro decals ordered the "Museum Collection" carbon decals and said it could take 6-8 weeks. And when looking at Hobbylink, it seems the status of the decals are changed from "out of stock" to "backordered" today, when I asked about those parts at my shop.